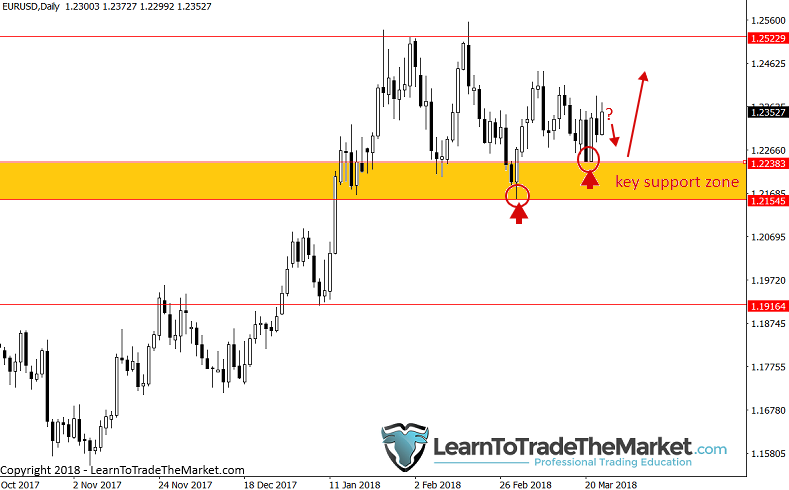 The EURUSD basically just consolidated last week, within the trading range structure between 1.2160 – 1.2520 we have been discussing in recent commentaries. We continue to look to buy this market as the overall trend is up and price is trading above key support levels still. Traders can watch for a pull back into 1.2240 – 1.2160 support area this week and look for price action buy signals there or slightly above to get long. However, failure at that support would open the door for larger decline into 1.1900 area and would temporarily nullify our bullish bias. The GBPUSD remains in an uptrend overall and price has risen higher in recent weeks after bouncing at 1.3760 support after a bullish pin bar there, as pictured below. We remain bullish on this market above the key support zone at 1.3760 – 1.3615 and traders can look for buy signals on a pullback whilst price is above that zone, watch the 21 day ema (blue level) for long signals as well. 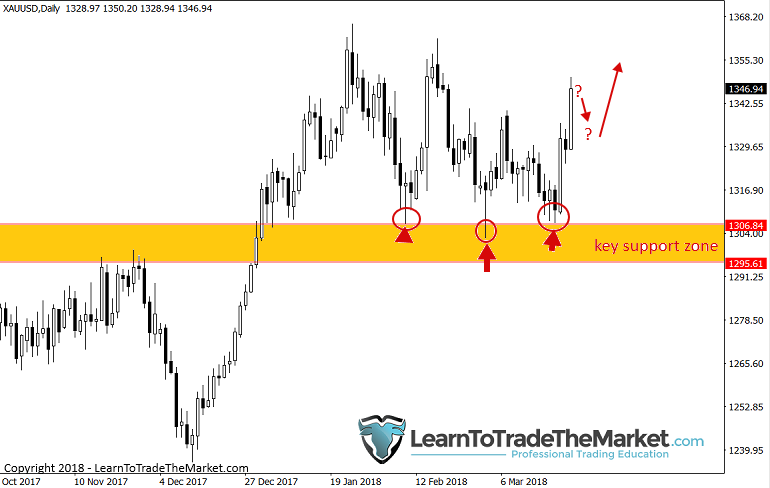 The Gold market surged higher last week after bouncing up from the key support zone at 1306.00 – 1295.00 on Wednesday. 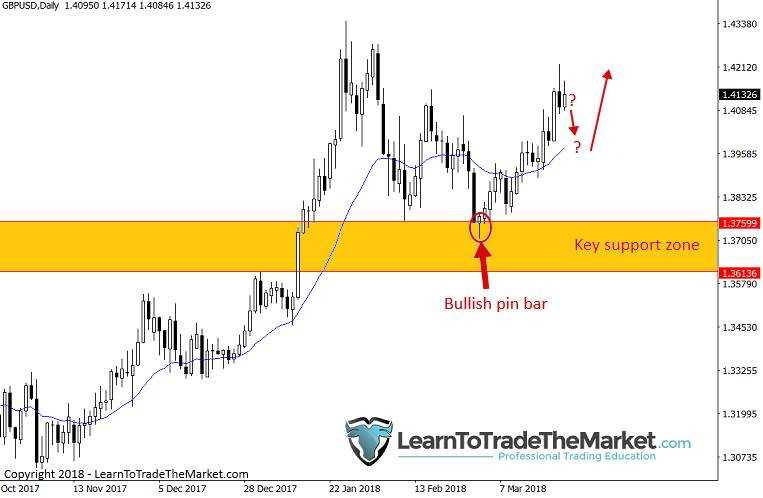 We have been looking to buy at that zone in our recent commentaries following the multiple bullish reversals and pin bars that have formed there in recent weeks. Traders who may have missed the long entry at support can wait for a pull back this week to get long on a 1 hour, 4 hour or daily chart buy signal as we feel there is more upside potential in Gold in the coming weeks. 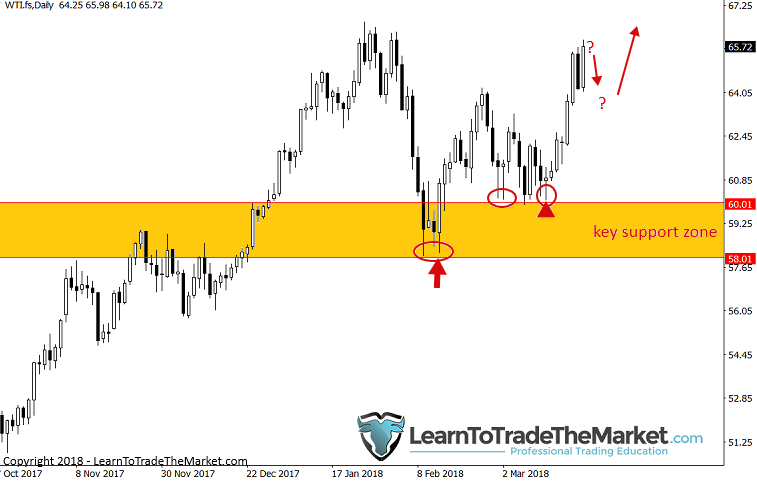 Crude Oil moved higher again last week as the bulls continue to push price higher as it keeps bouncing at key support near 60.00 – 58.00 area. We remain bullish on this market and we will watch for pull backs this week to get long on a clear 1 hour, 4 hour or daily chart buy signal. We remain bullish whilst prices are above 58.00.